Let's talk about sox, baby. Let's talk about toes and feet. and the bad things that may be. Let's talk about sox. Let's talk about sox! These socks from local boutique Silver in the City are probably my all-time favorite pair. But, they don't do a whole lot to protect my feel. I know, I know, what a terrible way to bastardize one of the iconic group's most famous songs. I couldn't help myself - it been running through my mind nearly every day for the past few weeks as I've experimented with, and finally found, socks that help protect my sensitive feet from blisters while I'm logging lots of daily miles (mostly walking, but more and more running each day, too). You may recall my recent post about my experiment with the Fitbit Flex and Fitbit One on a treadmill desk. Well, I've been a Fitbit stepping fool the past several weeks, and if you saw my feet...well, let's just say I won't be torturing my Instagram followers with gruesome images of the massive blisters on top of blisters that formed in the first two weeks of my march back to fitness. Frankly, I was a little afraid that even the woman who normally gives me a pedicure would run screaming from the room (not to mention afraid of even getting a pedicure because my feet were so raw). In desperation, I started researching blister prevention and stumbled upon several recommendations for different types of socks designed to reduce the friction and moisture that result in barking, angry dogs after logging 15 to 24 miles a day for several days. I made good use of my Amazon Prime membership and ordered several different pairs to try out. After a few days of experimenting, I finally found a two-pair combination that has stopped the blisters in their tracks, and even allowed my feet to heal without slowing down my progress. The combination of toe socks from Injinji worn under a pair of fitness socks from WrightSock have been my savior during 75 to 90 mile weeks. My highest single day total of 56,475 steps was just over 24 miles. I'd be lying if I didn't say I was tempted to log another couple of miles just to get that marathon distance. I could never have done it without the right socks. 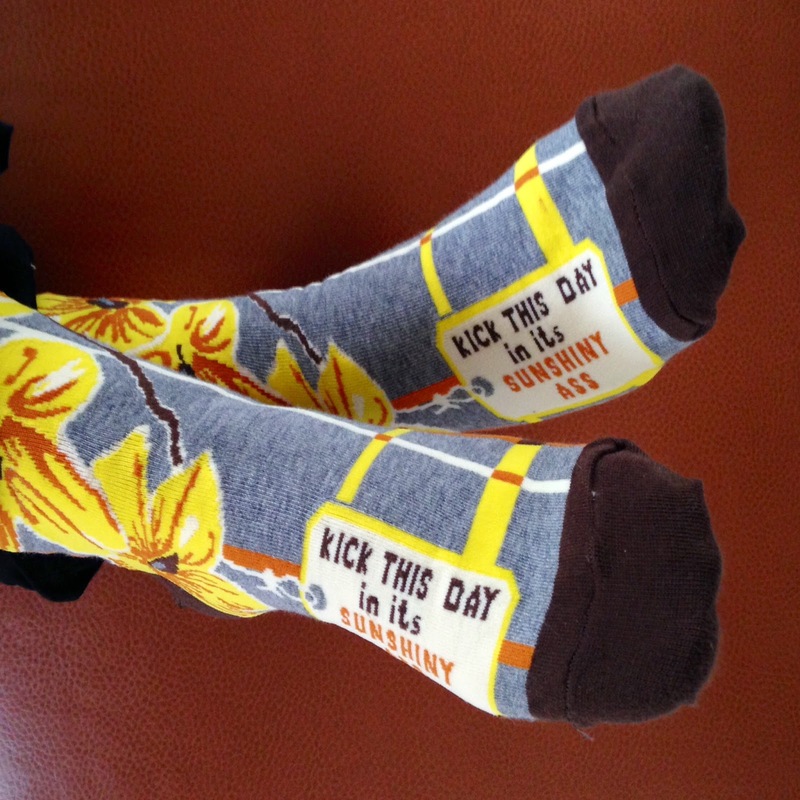 Granted, these socks are not the fun, kitschy variety I favor, and they're a little pricey. 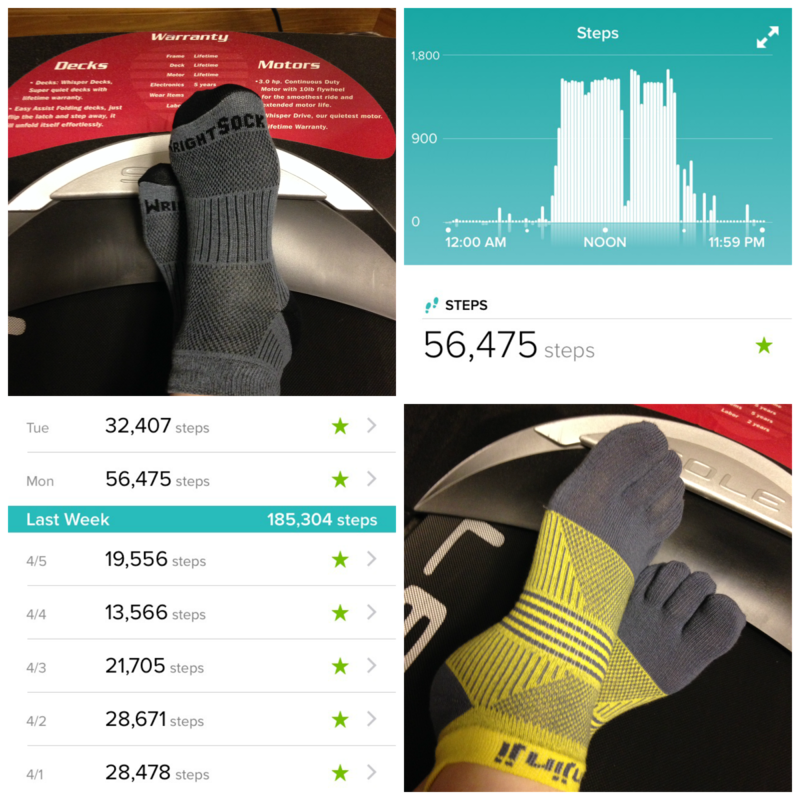 But the toe socks from Injinji (above right), worn underneath a second pair of fitness socks from WrightSock (above left) made me feel like I could live up to phrase on my all-time favorite socks (first photo, above) and "kick each day in it's sunshiny a$$." I've tried both types of socks on their own, but it's really the combination that works best for me. The toe socks are kind of hard to get used to, but having that barrier between the tootsies really helps with blisters. They're very thin, though, so adding the second pair cushions the soles of my feet while still keeping them from getting too hot. I now have several pair of these socks, and keep a clean combo in my bag so I can protect my feet whether I'm working from the treadmill or going for a run. Hi Lauren! They definitely don't play well with the retro dresses you and I are both so fond of, but for a workout, they can't be beat!